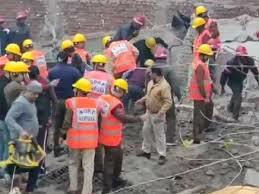 Police officials say that a 4-story building collapsed this morning in Gurugram’s Ullawas. The rescue mission is now on for the 8 people who are trapped. Officials have brought in a bulldozer to help them clear the debris, the fire department has also entered the scene and are trying to find the 8 people who are trapped. The building collapsed today at 5 am, no one knows what the reason behind the collapse is. The building is near the popular Cyber Hub in Ullawas. The NDRF (National Disaster Response Force) from Dwarka and Ghaziabad has stepped in to help rescue those who are trapped.